A fan favorite won't be in the line-up next season. Early in the week, rumors started heating up that the Giants were trying to move Jeff Keppinger, Andres Torres and reliever Ramon Ramirez. On Tuesday night, they got two-thirds of the way to making that a reality, as San Francisco dealt Ramirez and Torres to the Mets for outfielder Angel Pagan. Pagan is younger than Torres, and likely has more offensive upside, though both players had down years in 2011 (Torres was particularly disappointing, given his breakout in 2010). Losing Ramirez hurts because of bullpen depth, but the Giants made it clear they were ready to move some piece of the bullpen, and now they're doing just that. Giants star Brian Wilson goes inside the new Lockout-proof NBA 2K12 from 2K Sports. Most importantly, as Andrew Baggarly of the San Jose Mercury-News notes, is the fact that the Giants saved about $2-3 million on this deal. The Giants, as we've detailed, are in need of financial flexibility, and this move opens up their room to make another move more than before. However, that move isn't necessarily to acquire someone like Carlos Beltran -- as Grant Brisbee of McCovey Chronicles points out, this deal likely cements the Giants outfield. 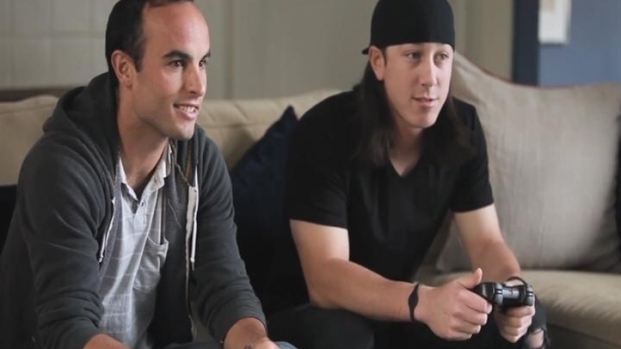 Check out the head to head battle between Giants star Tim Lincecum and soccer's Landon Donovan with FIFA 12 from EA Sports. Pagan will man center (though he could play right as well), Nate Schierholtz will handle the duties in right and Melky Cabrera will play left. That also means that Brandon Belt's going to be backup folks up in the outfield now, though an injury to anyone immediately opens up a whole for the prospect, as does Aubrey Huff struggling out of the gate at first base.